Uncovered valve assembly, marked where all the insulation needs to be replaced. The Ginna Nuclear Power Plant, approximately 20 miles east of Rochester in Ontario, Wayne County, is a single unit 2-loop pressurized water reactor. 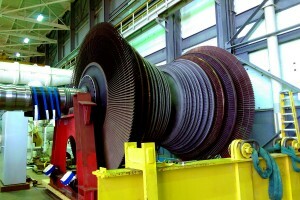 It can generate more than 580,000,000 watts of power and has been in operation since 1970. And in October, it got refueled. 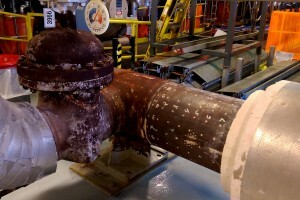 Since refueling means that the reactor must be shut down, the staff and engineers at the facility use the opportunity to perform maintenance on just about everything at the plant: replacing insulation, cleaning out oil tanks, inspecting all the pressure systems, and my favorite – replacing the turbine blade assembly. I was privileged to be given a behind-the-scenes-tour of the facility during the outage and see it all take place. Having just been to Ginna back in April for another tour, it was amazing to see the transformation from an active nuclear power plant to what could best be described as a combination of machine shop, construction site, and set of a sci-fi movie all rolled into one. Aside from all of the pieces that normally need replacing (valves, insulation, oil, gaskets, and the like), the nuclear fuel itself was being replaced as well. Nuclear fuel expends itself just like any other fuel does, and needs to be replaced from time to time. Ginna replaces about one-third of its fuel at a time. Water provides an excellent shield for radiation, and the reactor vessel is normally about half-full of water, like a giant swimming pool. When the spent fuel rods are extracted, even more water is added to provide additional shielding for the removal of the reactor cover and the fuel rods, which are now above the normal surface of the reactor cover. Since radiation exposure is always a concern, the spent fuel rods are taken through an underground, water-filled passage via a robotic sled and conveyed to the spent fuel storage facility without ever being exposed to the outside. New fuel is then added, the reactor cover goes back on, and the plant is now topped off with a full tank of fuel rods. The approximately 20′ diameter new turbine blade assembly about to be installed at Ginna nuclear power plant. As exciting as it is to see fuel rods being replaced, even more exciting was seeing the turbine blade assembly being replaced. What looks like a massive piece of metal is really thousands of individually tunable, very delicate thin blades arranged such that the pressure of the hot steam coming through the assembly causes catches the blades and spins the shaft. The blades are arranged so that as the speed of the steam changes as it travels through the assembly, they actually speed it back up and change its trajectory so that more blades farther down can extract even more energy out of the hot steam. All in all, this assembly, turning a magnetic shaft in a generator, is capable of maintaining 583 million watts of power. Perhaps the best part of this maintenance outage, which occurs every 18 months or so as fuel is expended, is its economic impact. More than 700 temporary workers come to the area to work on the plant, replace worn equipment, clean out ventilation shafts, and the thousands of other things that need to be done. In the back lot of the facility, a virtual “tent city” of construction trailers were arranged, and the normally spacious conference room was transformed into a NASA-like command center coordinating all of the work. Not only does Ginna create jobs this way, but those workers have to sleep and eat and the local hospitality, retail stores, groceries, and entertainment businesses all get a boost as well. Ginna is licensed to operate until 2029. It may sound like a long ways a way, but the end of Ginna will mean an end to one of the best maintained nuclear power plants in the country, emission-free power generation for approximately 500,000 homes in the area, and almost 1500 full-time and part-time jobs. I hope to be invited back again for the next refueling, and the next 8 or so after that, as well.